There are 2 ferry routes operating between Tenerife and Gran Canaria offering you combined total of 59 sailings per week. 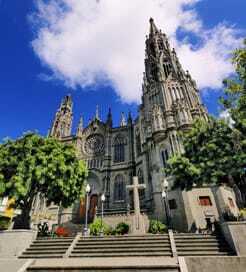 Trasmediterranea operates 1 route, Santa Cruz de Tenerife to Las Palmas which runs 1 time weekly. Naviera Armas operates 1 route, Santa Cruz de Tenerife to Las Palmas which runs 2 times weekly. Fred Olsen Express operates 1 route, Santa Cruz de Tenerife to Agaete which runs 8 times daily. As the frequency and duration of crossings on some routes varies we would advise that you do a live search for crossings from Tenerife to Gran Canaria to get the most up to date information. 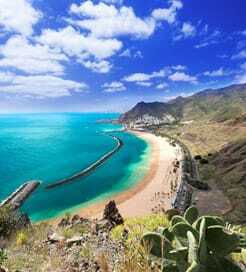 Tenerife is the largest and most populous island of the seven Canary Islands with 43 percent of the total population of the Canary Islands, and is also the most populous island of Spain. Tenerife is also the most visited island in the Canary island group, welcoming over ten million visitors per year with its lovely weather, beautiful coastlines, spectacular beaches, lush forests, mountains, volcanoes, as well as two world heritage sites, one National Park, and 42 natural protected spaces. The weather is one of the main reasons for the influx of visitors to Tenerife’s shores with almost guaranteed sunshine year round. As a result, this family friendly island is consistently one of Europe’s top winter sun destinations. Though the island has 2 airports, inter island travel is best by ferry. As the largest island in the group, Tenerife acts as a hub for many of the other Canary Islands with frequent crossings offered by Spain’s best known ferry operators. There are also regular crossings connecting Tenerife to the mainland for those who enjoy spending their travel time at sea.